The Pacific treefrog has it names announces is a specie of treefrog that lives on the Pacific Coast of United States and Canada. The pacific treefrogs live in a wide range of habitats, from see level to more than 10000 feet. They can be identified by their long legs that end up by the sticky toe pads they have at the end of their toes which is used to climb. The dark stripe that goes from the nose up to the shoulders is also a distinctive character. The Pacific Tree Frog is medium size grows up to 5 cm and males are usually smaller then females and can be distinguished by the black spot on their throat, the vocal sac that expands when they call. Pacific frogs are usually green or brown with a pale belly, but can range from reddish, grey or brown. They are able change colours overs relatively short laps of time to adapt to their environment and to seasons. It’s a mostly nocturnal tree frog specie that is really good at hiding under rocks, logs, trees and long grasses during the day. They feed on insects and arthropods of all size and can stretch their bodies to fit the menu. When hunting the pacific tree frog use it’s toe pads to climb and ambush waiting to launch unpredictable attacks upon their preys. The breading period for Pacific Tree Frogs begins in early winter to early spring but because of the wide geographical distribution of this specie, their breeding season is determined by local conditions. The male calls the females with his “Creck-hek” sound and the mate in water with the females which later lay 10 to 100 eggs under vegetation in the water which will than transform in tadpoles after 7-21 days. 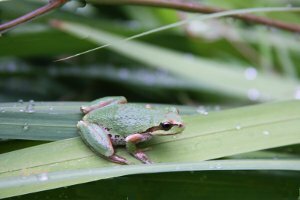 The Pacific treefrog familly has 3 sub-species : the Sierran tree frog (Pseudacris regilla sierra), the Baja California tree frog (Pseudacris regilla hypochondria) and the Northern pacific tree frog (Pseudacris regilla regilla), the only one found in Canada..